Dear Parents and Relatives, The Digital Media Class is looking for any pictures or video you would like included in the graduation video. You can send them with your student for us to scan and send back, or you can email them to marcusspotanski19@esu8.org, cadegoger19@esu8.org, baileypatterson19@esu8.org, dylanglaser19@esu8.org, moorghanprusa19@esu8.org, or isaacglaser19@esu8.org and zacharyhansen19@esu8.org. Senior Video . 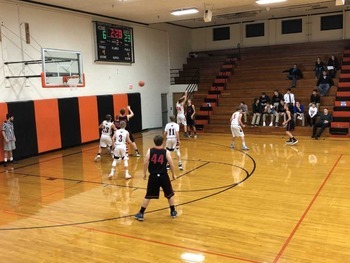 . .
BBB: Mustangs victorious in finale The Stanton Mustang Boys ended their regular season with a win over Emerson-Hubbard 45-39. The Mustangs took and early 9-5 first quarter lead, but the Pirates would battle back in quarter two, taking it 21-17. With the game tied 26-26 the game went to the half. “We felt that we had opportunities throughout the first half to go some runs, but we had too many turnovers and missed free . 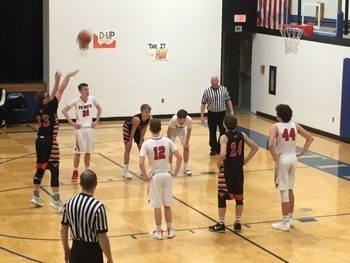 . .
BBB: Setbacks lead to opportunity The Stanton Mustang Boys fell in game 2 of the East Husker Conference tournament to Pender last week. The Mustangs jumped out to a 15-9 first quarter lead and then outlasted the Pendragons in the second quarter 9-8 to take a 24-17 halftime lead. Stanton would run into a scoring drought in the 3 rd quarter as Pender outlasted the Mustangs 11-3. Pender carried their 1 point lead in the 4 th . 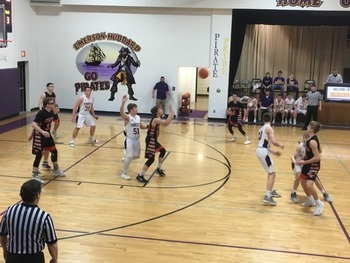 . .
BBB: Enter Conference Play The Stanton Mustang Boys entered round 1 of East Husker Conference Basketball tournament and played the #6 seeded Logan View/Scribner Snyder Raiders The Mustangs took and early 11-6 first quarter lead and the Raider narrowly took the next quarter 10-8. Stanton went into the halftime with a 19-16 lead. “We felt very good about the looks we were getting on offense and our over game . 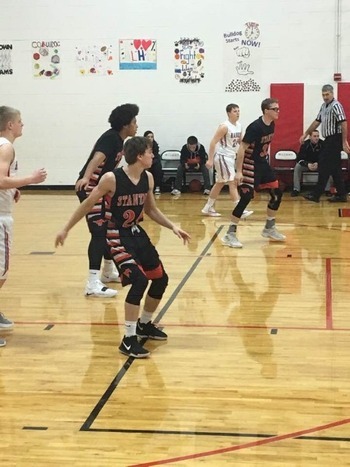 . .
Mustang BBB finish week 2-1 The Stanton Mustang Boys finished the week 2-1 with wins over Plainview and Boone Central, with their one loss coming to Battle Creek. The week started with a Tuesday trip to Plainview. The Mustangs had things going on both sides of the court as they went into the break leading 28-24. Stanton would continue its solid play in the second half outscoring they Pirates 11-7 and 16-12, as they went . . . The girls basketball team improved to 10-5 on the season as they went 3-0 last week. The Mustangs started their long week off by traveling to Plainview to take on the Pirates and walking away with a 58-24 victory. All twelve girls saw action in the contest. Collectively, the Mustangs took away 21 passes which made for easy shots on offensive end of the floor. Boone Central/Newman Grove came into Stanton to take on the girls in a . . . The Stanton Boys basketball C Team has been active with games since the beginning of the season. The team has been focused on growth and development, with an emphasis on having fun throughout the process. As a team built of freshmen and sophomores, not only is there fundamental development, but also establishment of a comfort level in the game of basketball with new teammates. The boys have proven to be up for the . 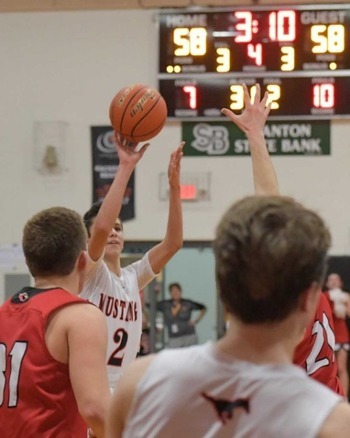 . .
Half Court Shot Propels Mustangs The Stanton Mustang Boys had a wild finish in last Friday’s home basketball game vs Oakland-Craig. Stanton took a 8-5 1 first quarter lead, Oakland would outpace the Mustangs in the 2 nd quarter 14-13, but Stanton lead at half 21-19. “We were very happy with our first half performance and new that we would have to continue a high level of play to finish the game.” said Stoddard. . . .
Mustang Boys finish 3 rd in Holiday Tournament The Stanton Mustang Boys finished 3 rd place in the Stanton Holiday Tournament over the break. In game one the Mustangs hosted the Oneill Eagles. The Mustangs would fall behind 24-19 at half. “We struggled with their full court press and half court trap throughout the first half and we knew that we needed to slow things down and handle the on ball pressure” , said . . . Welcome to the Stanton Community Schools web page. I am very proud of the students & staff at our schools; we work hard everyday to challenge all to be their best. As the Superintendent of Schools, I welcome any feedback to make our school better for our students. Please feel free to e-mail me at msieh@esu8.org or by calling the school. I have enclosed part of my resume for you to view so that you may know and understand me maybe a little better. Sincerely Michael J. Sieh EDUCATION University of . . .
April 23, 2019 April 18, 2019 April 17, 2019 April 16, 2019 April 15, 2019 April 12, 2019 April 11, 2019 April 10, 2019 April 5, 2019 April 4, 2019 April 3, 2019 April 2, 2019 March 29, 2019 March 28, 2019 March 27, 2019 March 26, 2019 March 22, 2019 March 21, 2019 March 20, 2019 March 13, 2019 March 12, 2019 March 11, 2019 March 7, 2019 March 6, 2019 March 5, 2019 March 4, 2019 February 28, 2019 February 27, 2019 February 26, 2019 February 25, 2019 February 22, 2019 February 20, 2019 February 19, 2019 February 18, 2019 February 15, 2019 February 14, 2019 February 12, 2019 Feb 11, 2019 February 8, 2019 February 7, 2019 February 6, 2019 February 5, 2019 February 4, 2019 February 1, 2019 January 29, 2019 January 28, 2019 January 23, 2019 January 18, 2019 January 17, 2019 January 16, 2019 January 15, 2019 January 11, 2019 . . .
Stanton Community Schools News Update Headlines from Stanton Community Schools, delivered straight to your inbox! How to subscribe or Unsubscribe to Our Mailing Lists 1) Select whether you want to subscribe or unsubscribe. subscribe or unsubscribe 2) Enter your email address and click the "Submit" button. Remember, if you have a pager with e-mail capabilities, you can use that e-mail address here too! If you have any questions, please contact rspotans@esu8.org Your name and email address are kept private and are for the sole use of the Stanton Community Schools Website . For full details, see our privacy and security policy.